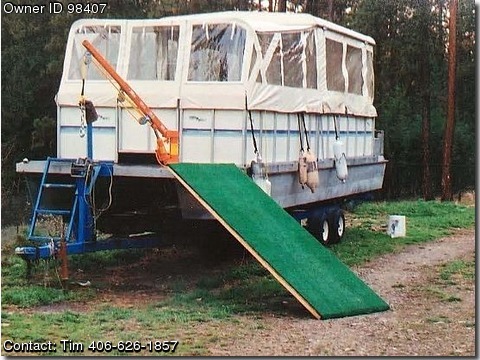 Boat is located in Frehctown,Montana.Please contact the owner at 406-626-one eight five seven…BOAT OWNER&#39;S NOTES for 1985 CHINOOK 28&#39; Pontoon Boat in Very Good Condition, call Tim Wall @ 406-626-1857. Rugged and comfortable 28&#39; CHINOOK motor home on the water, Built in the north west to handle the weather,and rough water. ENGINE &amp; EQUIPMENT UPGRADES: About 20-hours on a total rebuild of the 2001, 70-hp Johnson motorm, New anti tork steering, new throttle controls, new 14&quot; prop which is very dependable and well cared for, Full canvases with new zippers for easy installation, portable toilet, propane heater, 600-feet of anchor rope, stainless steel anchor, 5-part line on a swivel boom to pull anchor up, easy.ladder built in for swimmers. TROLLING MOTOR: 34-lb thrust Minn Kota trolling motor and battery, fish finder, new tack and gauges. TRAILER: The trailer has new 10-ply tires and 4-6 ply extra tires, new wheels, new hubs, new bearings and a new spare tire and wheel, Guides on the trailer make loading easy as well. This boat is in excellent shape, clean, ready to go, Health issues make it difficult to enjoy anymore, it&#39;s priced to sell and ready for years of trouble free enjoyment, Life jackets and other stuff go with it too! Call Tim with any questions or to see the boat @ 406-626-1857.